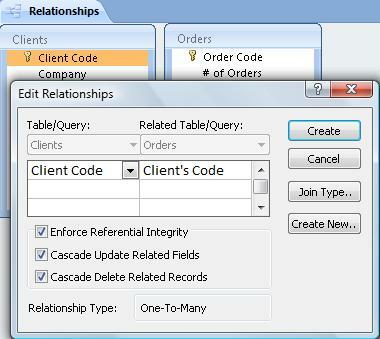 Once our Data Base is open, we click on the "Relationships" icon. The first time, the window will be empty. On it, we will see the window for "Show Table". 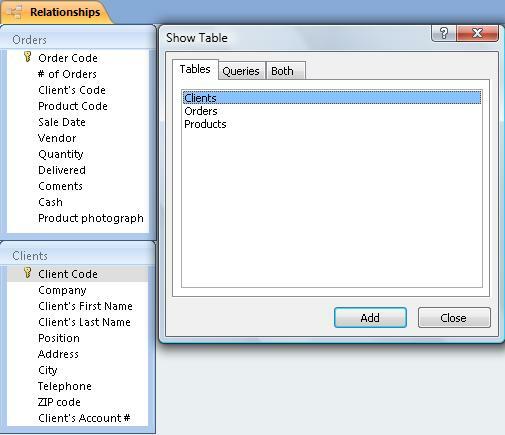 To create a relationship between Tables, first, we need to select (add) one of the Tables we want to relate. We mark it and click the icon "Add". Then, we select the other Table and select "Add" again. Then, we click on "Close". We will relate the "Clients" and "Orders" tables. 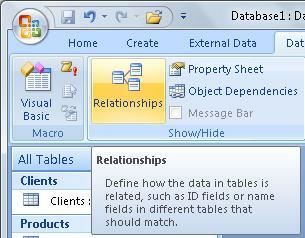 In the upper part, we see the Tables and Fields which form the relationship. In the lower portion, the characteristics of this relationship are defined. We will see them in the next Lesson.